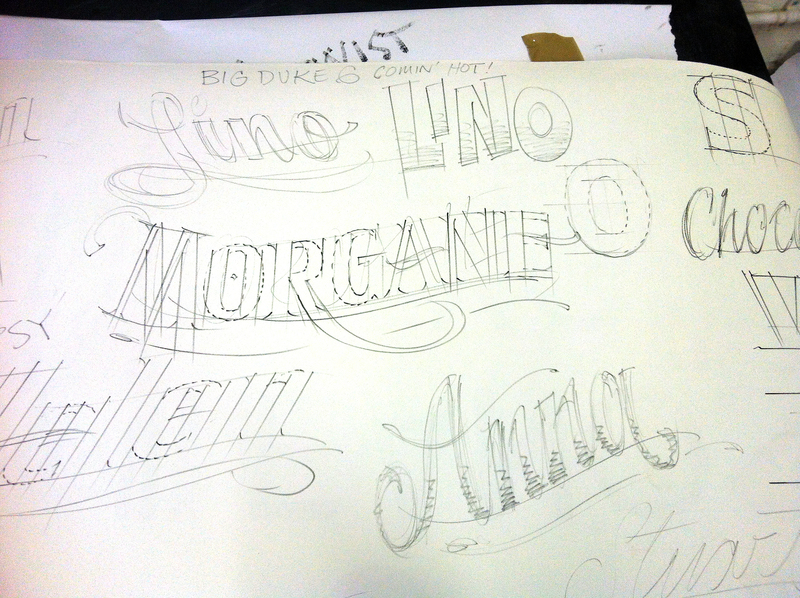 The Type Tasting studio turned into a creative wonderland of ink and hand painted letters this weekend. 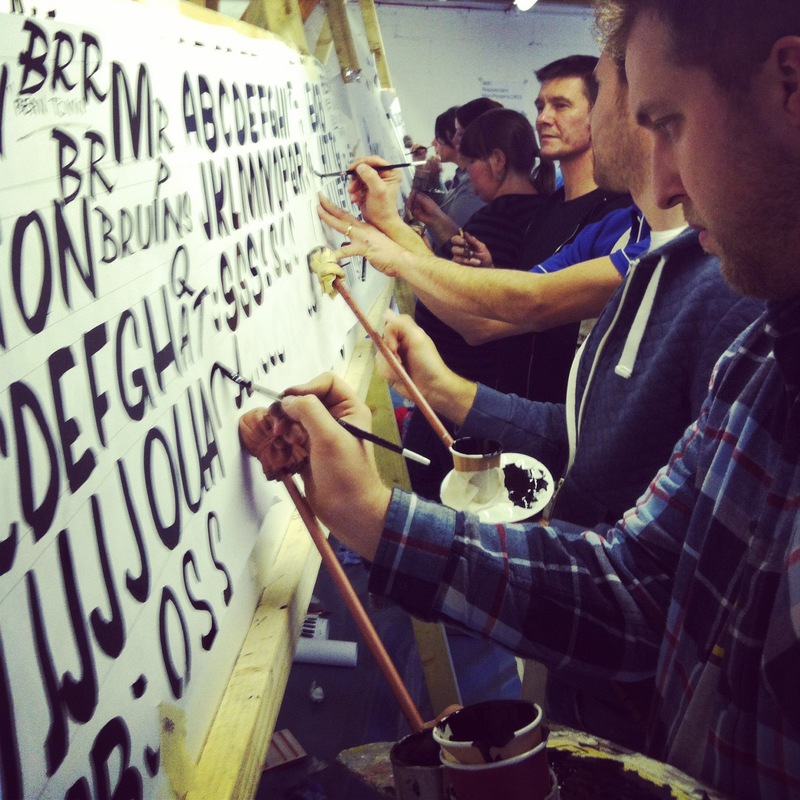 To coincide with the London screenings of Sign Painters Mike Meyer, one of the film’s stars, came to town to deliver an intensive two-day sign painting workshop which was organised by Sam from Better Letters. 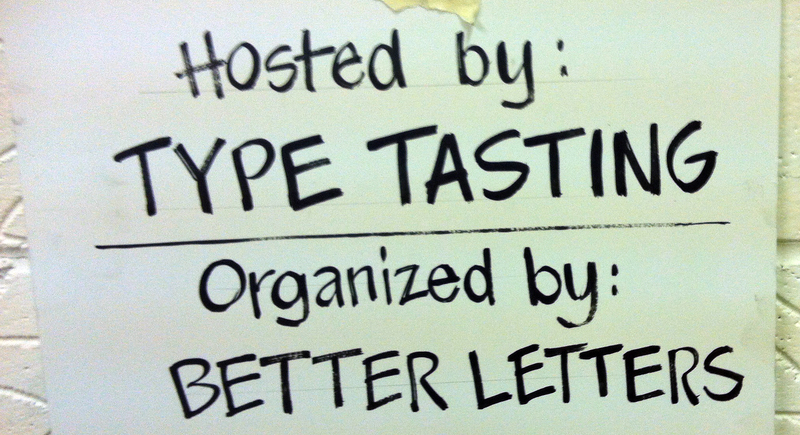 Mike teamed up with the Brilliant Sign Co. and under their expert guidance we filled the Type Tasting studio with inky lettering. 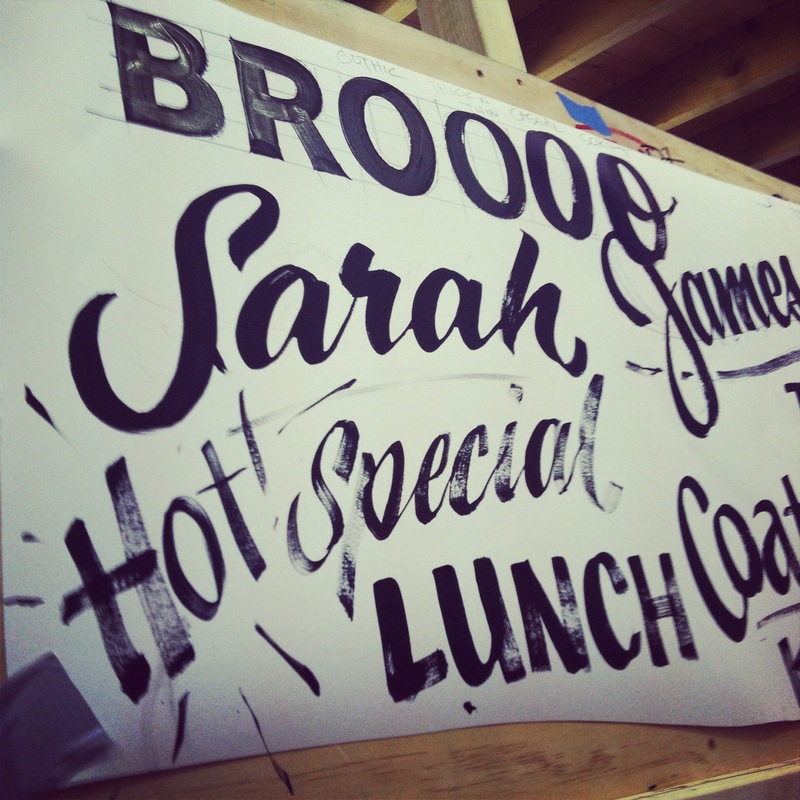 The art of hand painted signs has dwindled in recent decades as computers have taken over, but it continues to be a living trade and is currently enjoying a resurgence in interest. This was demonstrated by the film’s popularity (the opening night sold out almost instantly and the run was extended), the demand for the workshop and the buzz that’s been created. I think the resurgence also has a lot to do with the personalities who’ve taken on the roles of ambassadors for this commercial art form. Mike Meyer is a larger than life character with a sense of wonder (and a big love of chocolate) whose exuberance is infectious. He’s full of stories, many of which he tells, but most of which come tumbling out of his paintbrush like typographic tourettes. 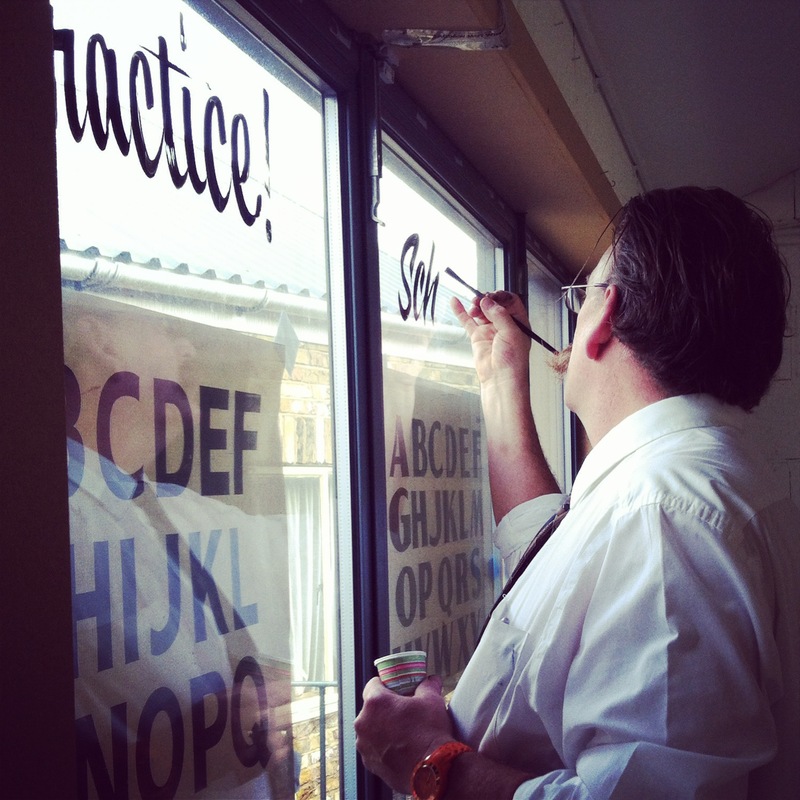 Sign painters are skilled typographers who understand the nuances of what typefaces work where and why. How the tone and the mood is altered with different styles or treatment of letters, and that a sign is there for a functional reason which is ultimately to influence people. 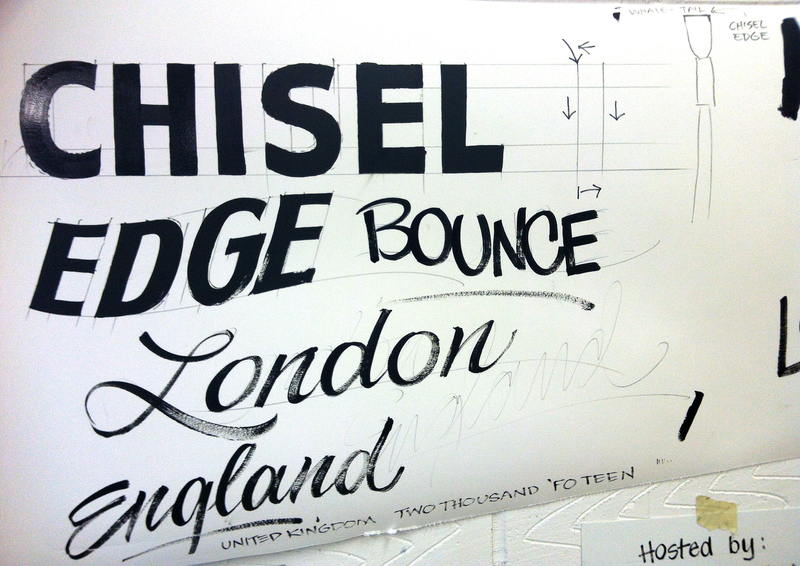 It isn’t more expensive to have a sign painted, and hand painting can often be quicker than vinyl cut lettering. However what these signs have over vinyl, without question, is the human touch where the slight imperfections create a welcoming voice with the warmth of an accent and not robotic perfection. 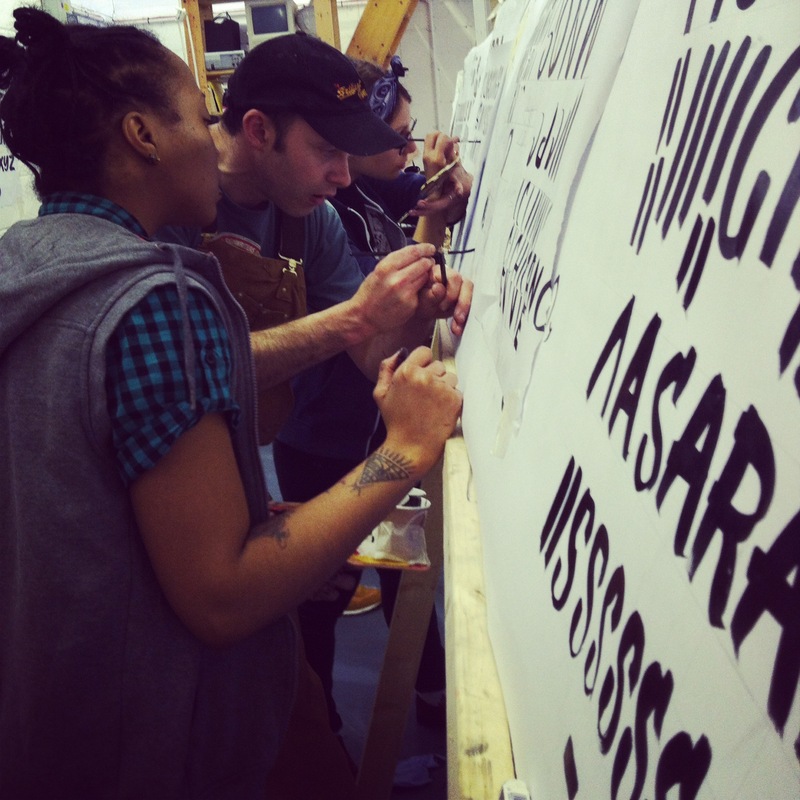 For me this was a magical weekend where my life came full circle, having spent the first two years of my working life at a small sign making company. 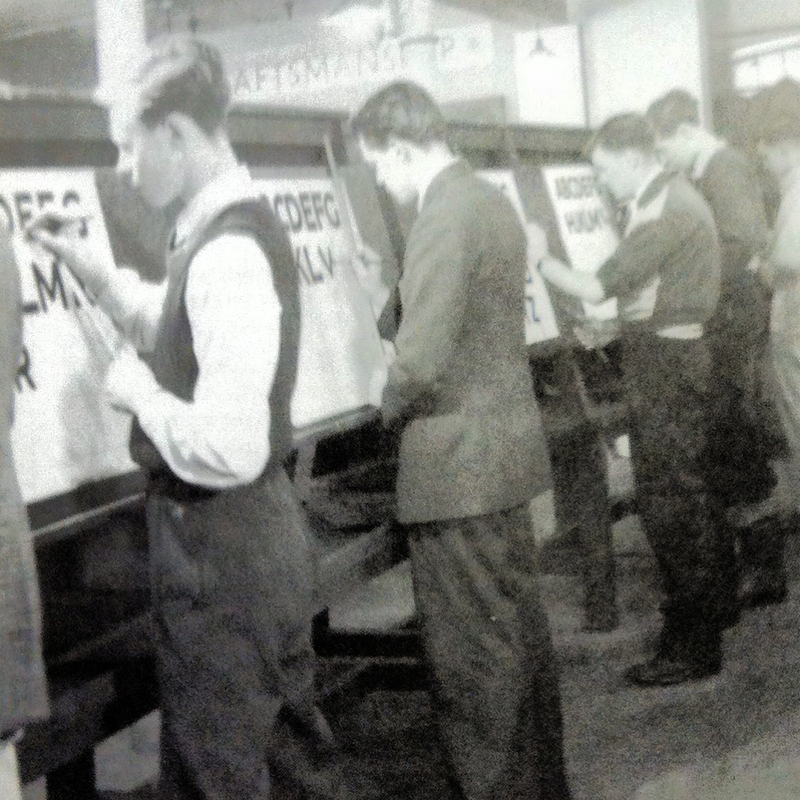 Sadly we were a part of the vinyl lettering movement, although we also did a lot of hand cutting and screen printing. 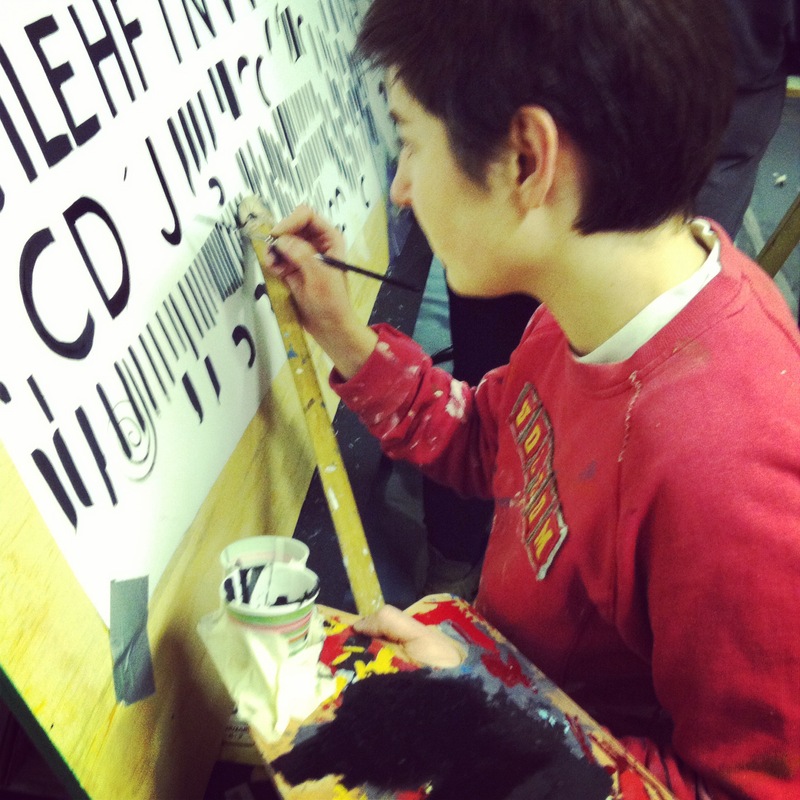 Spending this recent weekend with a paintbrush in my hand has reignited both my love of letters and my love of being at the making end of the design process. And above all, it’s reminded me not to stress the small stuff because at the end of the day #IOAFS. 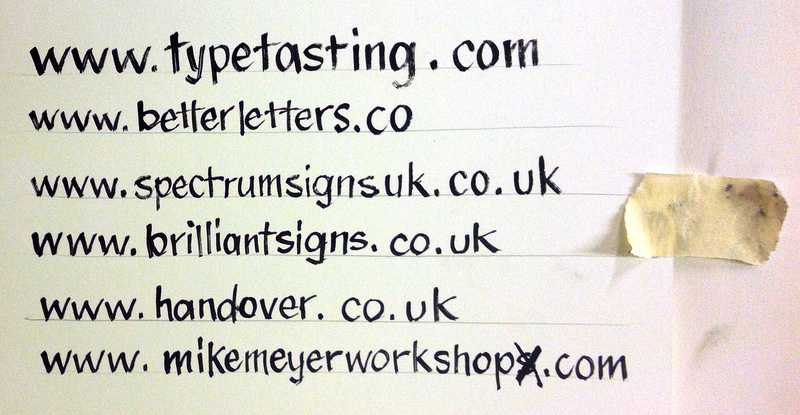 By Sarah Hyndman, founder of Type Tasting. 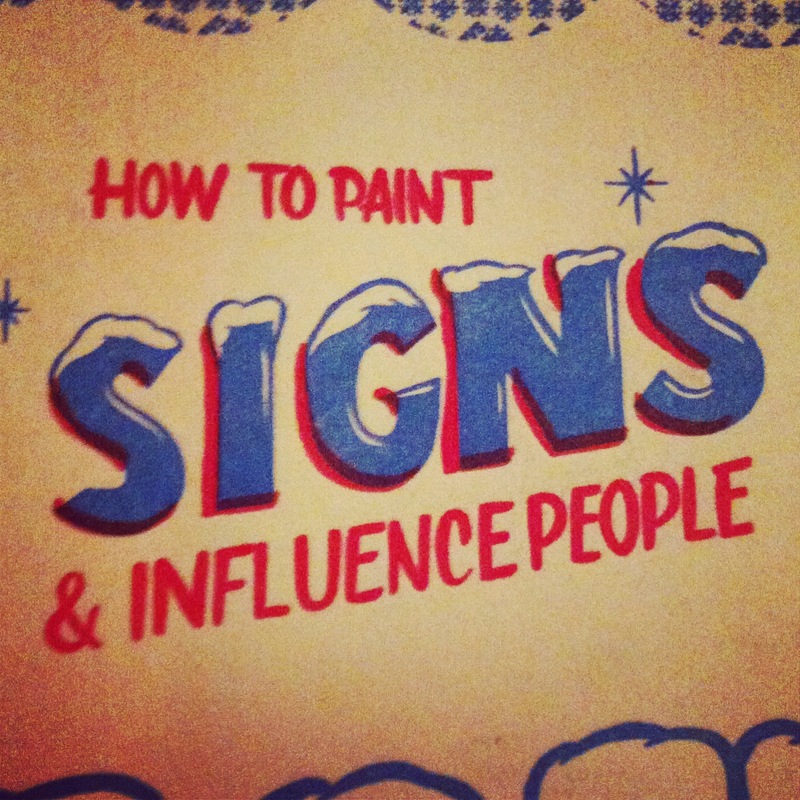 “When Alice woke on Monday morning she remembered that she had spent the weekend on the sign painting workshop when she looked at the state of her previously manicured hands” Ash Bishop, Brilliant Sign Co.
Sign up to the Better Letters website to find out about future Signpainting events. I completely agree Sam, I’ll be first in the queue for the next installment. Great article Sarah, I’m overwhelmed with the positive feedback, it was a pleasure to be involved.